2 Which font to get? 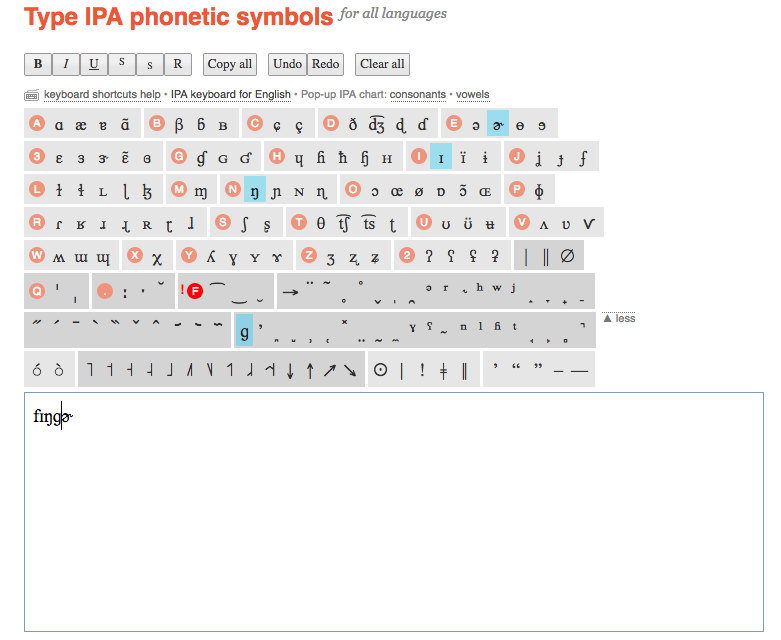 This page explains how to set up International Phonetic Alphabet IPA fonts and keyboard layouts on your computer. This is because many fonts only have a partial Unicode character set, which covers the standard (Latin alphabet) ASCII set but not much more. Your computer will substitute a more comprehensive font if its default font lacks the IPA characters. On Mac OS, this is Lucida Grande, for example. I like Linux Libertine and Linux Biolinum. The fonts are freely distributed under a GNU Public License, and they work on any OS. Another popular font is Doulos SIL. See the SIL webpage for details. I think it’s kind of ugly. This is the slow but universal way. It even works on iOS and Android. Go to ipa.typeit.org. You can point and click on any IPA symbol with your mouse or finger, and the character will appear in the text box. From there, you can copy and paste the transcriptions into your document writing program, then change the font of the doc to Linux Libertine if you like, and you’re done. Another nice interface is http://westonruter.github.io/ipa-chart/keyboard/. That one lays out the IPA symbols in an actual clickable IPA chart. These are much faster and more efficient. Invest some time into learning them and you will save yourself time in the long run. Check out this page, ipa4linguists. It explains how to use the Character Map, and also covers the various quirks of Windows. I found one IPA keyboard layout for Windows. I cannot vouch for this thing, but if it works, that is by far the most efficient way of working with IPA fonts (see the next section on Macs). These instructions should be current as of Mac OS 10.8x and 10.9x. I use the IPA-SIL keyboard layout, which I am providing it for download here since SIL is no longer distributing or supporting it. The zip file includes a PDF with more detailed documentation. The keyboard layout allows you to type in IPA without using “dead keys” (keystroke sequences that turn into a single character, for example, typing “i” and then “=” gives you “ɪ”). Ain’t nobody got time for that. hitting Cmd+Space switches the input method from English to IPA-SIL. Once in IPA-SIL mode, you can type normal lowercase Latin characters without doing anything. For anything else, you can use the Character Viewer on Mac OS. Just open it from your Input Methods menu (which can be enabled from Settings>Keyboard). There are more detailed instructions in the PDF inside the zip file linked above. put the IPA-SIL.keylayout file into Users/yourusername/Library/Keyboard Layouts. Put the IPA-SILicns icon file there as well. then enable the IPA-SIL keyboard by going to Settings>Language & Text > Input sources. Scroll down the long list of keyboards until you see IPA-SIL; if you don’t see it, you might need to restart the machine. Then check it. Check on “Show input menu in menu bar”. Mac OS likes to take away features, especially ones that allow you to customize the system. If you cannot see the Library folder inside your Users/yourusername directory, go to your favorite search engine and look for the solution that is specific to your version of Mac OS. If that fails, there is also Character Map type thing that you can use. For some non-IPA characters that linguists use, it was suprisingly difficult to figure out how to enter them on Linux. The crucial bit (on Linux Mint, anyway, but probably others too) is to enable a “Compose Key” in your keyboard layout. Go to Preferences>Keyboard>Layouts, select “English (US)”, then Options, then find “Position of Compose Key”. I chose Caps Lock for mine. What this does is allow you to type various characters like é and ü by pressing the Compose Key together with ‘ or “, etc. A list of all the default key combinations enabled in Linux can be downloaded as a tab-separated text file here. Go to your “App store” or whatever and search for “IPA keyboard”, or “IPA phonetics”.